Preparation is everything in sales, so you want to start every opportunity with the end in mind, because the negotiation is where you bring it all together and get the final agreement to buy. The more shortcuts you take, the less likely you are to end up with a delivery. What do you want to happen when you head inside to write them up? • Do you want to make a sale? 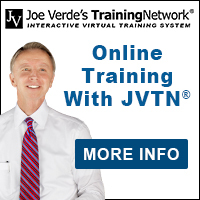 • Do you want an easy deal to work or tough ‘grind it out’ session? • Do you want to make the sale with a big commission or a mini? • Do you want a happy buyer on delivery or someone who dings you and the process on the survey? Of course, you want to end up with a customer ready to buy, a little light budget focused negotiation, and you’d like to deliver it at full price with a nice commission, a happy customer score, and a repeat customer forever. Instead of doing what it takes to make it all happen when it gets to the write up (if it gets there), too many salespeople shortcut everything with almost everyone – end up with small commissions, and hope for one big ‘rip their head off’ deal to make their month. Go back and read the comments. If you just follow my 8 steps every time, slow down, stay away from price, find each customers’ buying motives, so you can target those in your demo and presentation, and then close on value, not on price – you’d be writing those comments instead of reading them. I did so many things wrong as the 8 car guy until I learned more – and focusing everything on price and skipping the demo or making it as short as possible were my two worst enemies in sales. Getting a new car is fun – paying for it though, isn’t that much fun. The demo is the highest emotional point in the selling process, and I was skipping that step as often as possible. To make my odds worse – I asked all of the ‘prequalifying’ price, trade, down, and payment questions and basically worked the deal on the lot before I even told them very much about the car. Why bother trying to sell it if I didn’t think they could buy. If I had just done it right. But my problem was that I never heard right, I just did what all of the other below average salespeople did with each customer. Talk about ‘pain’ – what a waste of 5 years of long days & almost no days off. not when you write up someone. • Once you’re inside, follow my simple, fast, efficient, profitable, customer friendly 3-pass negotiation process. Do this, and the negotiation simply becomes the final wrap up. Learning to set goals is so important in sales and our lives. 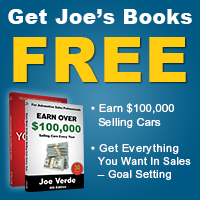 Download this book by Joe Verde, the leader in car sales training, “Get Everything You Want In Sales” today (it’s FREE) and learn how to control your own destiny.